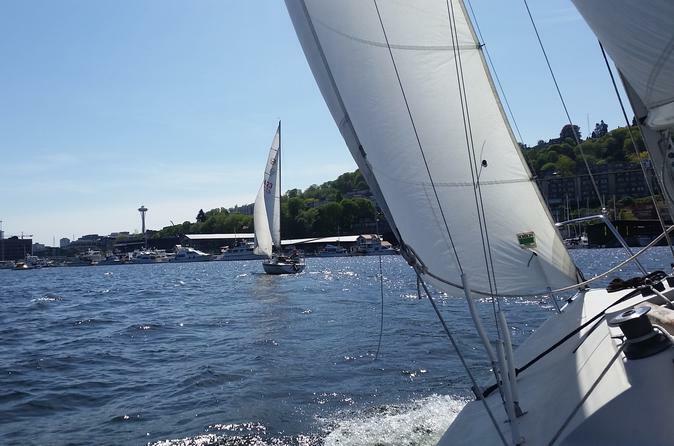 Two-hour sailing lesson on Lake Union in Seattle with a professional captain to show you the ropes on a small, exciting boat that is electric and eco-friendly. Set sail and enjoy the fantastic views from the water with a small-group and personal attention right in the heart of Seattle. This introduction to sailing class will provide for those with a sense of adventure and cover the basics, safety, and sailing theory. The lesson is easy to fit in your schedule with multiple departure offered throughout the day to choose from. You will learn how to tack, jibe, and drive the boat. Whether you aspire to sail around the world, own your own boat someday, or have been sailing before, this is a fantastic opportunity to get on the water in the heart of Seattle and experience the Emerald City as it was intended.